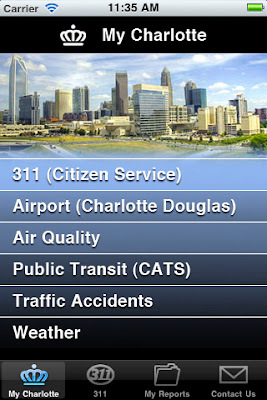 According to a press release sent out yesterday, the City of Charlotte has launched “My-Charlotte,” a mobile application for wireless smart phones that allows users to access municipal services on the go. I applaud the city for embracing the digital and mobile age we're living in, but I'm not sure spending $120,000 developing this application is the best use of funds right now. Especially since the app doesn't appear to have many beneficial uses yet. Searching traffic accident locations from CMPD or reporting potholes to 311 are not strong selling points to me. This app sounds like an idea a city IT guy made seem cool to his bosses. I'm sure there are more features to come, but the city's web services are probably not advanced enough or compatible to make the application worth having. The one customer review posted so far on the iTunes page where the app is sold, points out that "it's less an app and more just a collection of web pages. Most are not even formatted to be used easily on an iPhone." Currently the application is available only on the iPhone, but the city said it plans to expand into other mobile platforms such as the Motorola DROID and BlackBerry early next year. I'm not the type who bashes government spending simply for the sake of doing it, and maybe the potential dollars the city believes it could save by people using their mobile app rather than calling 311 will help the investment pay for itself. Hopefully within a few months the city will update us on the success of this venture. And I'm sure users will post their reviews. Do you plan to buy the app? Do you think it's useful? Click here to read the full press release from the city. 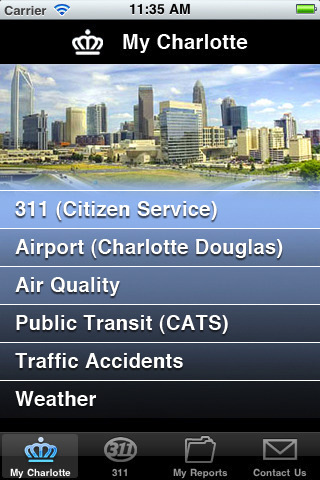 Click here to purchase the My-Charlotte app from iTunes.